The Valley Art Gallery’s ART’S UP Opening Reception on September 29, 2018 was well-attended; even more than we knew! It was great to see several people who came and for those who came after we had left. Which goes to show that one should stay to the end! The art exhibition in the John Muir Medical Center in Walnut Creek (lower level of the building with the parking garage above) will switch at the middle of December. The current exhibition will come down (December 14, Friday) and the next one, sponsored by the CC 14 Art Group will go up on December 15, 2018 (Saturday). The CC14 exhibit will continue until January 11, 2019. Have a wonderful year-end Holiday Season! Under the auspices of the Pleasant Hill Senior Center and EBAG (East Bay Artist Guild), a few artists will be at the Pleasant Hill Senior Center with small pieces of art for viewing and sale. True, the “sale” part is a bit late for Christmas this year, but think about how far ahead you would be for Christmas 2019! Of course, viewing and chatting are also good. Hoping everyone is having a wonderful holiday season and I wish you a very Happy New Year! – The title of the exhibition is “ART’S UP” and three of my pattern-paintings will be among the 300 works being exhibited from East Bay artists working in all media. “Fall’s new art now up and running across the walls—real and virtual—of Valley Art Gallery. Some 300 works, for sale or rent, representing the best from the best of East Bay artists working in every style, media and motif you can imagine. So surf on in—to the gallery or online. Either way the Art’s Up. Perhaps I’ll see you at the Opening! I’m not sure how time can fly so fast but have found—unfortunately ‘as usual’—my schedule is out-of-date! Well, with this posting it is now current and will remain so…for at least a while. Definitely a rainy winter in California! We hope at least one day will be sunny, however, and that is Saturday, March 25th 2017. SWAN Day in downtown Martinez is back! Like last year, it will be held—rain or shine!—at and around Martinez’s Old Train Depot. Art on display and offered for sale at the Martinez event is handmade by the individual artists. Keiko will participate with a selection of her paintings, prints, cards, coasters, ornaments and her unique washi-paper desk organizers. 10:00 am – 4:00 pm Rain or Shine! I’m not sure how time can fly so fast but have found—unfortunately ‘as usual’—my schedule is out-of-date! Well, with this posting it is now current and will remain so…for at least awhile. – The theme of the exhibition is “Water” and each of the participating artists will create an original item especially for this show. As for my painting, I am still thinking and planning—so many possibilities and whatever I end up creating will be—at least I hope—part of my Waterscapes series. Or maybe Tropical Marine Life? Or something totally new? Regardless, I will be ready! Refreshments will be served. Artists are available for tours and questions! In future my schedule will hopefully be more continuously current—especially after the ‘mentoring’ session I had with my business manager…!! After a very busy first half of the year, we are finally managing to update our Event listing. I’m sorry it has taken so long to do so! Great opportunity for early Christmas shopping! Please see further details of venue, specific times and receptions on the “Upcoming Events & Shows” page. If there are any questions, please let me know! As for painting, I am currently focused on my series of the universe—which I have begun to call the “Cosmic Worlds.” Similar to my other series, I focus on painting different views or aspects of a common theme. For Cosmic Worlds, that theme is the surreal beauty of deep space. The breathtaking photos from the Hubble Telescope are definitely an ongoing inspiration for me. How could things apparently at random be so astoundingly beautiful? 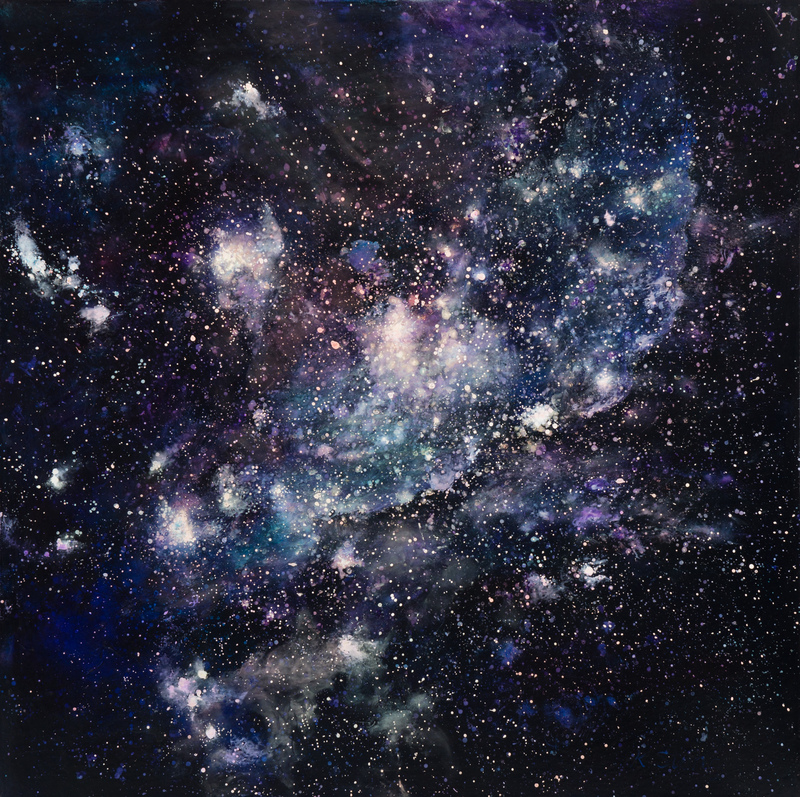 Titled, ‘Star Dust’ this painting portrays NGC 346, Emission Nebula and the immensity and depth of space. And finally, somewhat in the same ‘ball park,’ last week brought to Earth the stunning photographs of Pluto. Art subjects are everywhere! I hope you enjoy these exhibits and wish everyone a very enjoyable summer!